The Gift of Prevention: At NFID, our vision for 2019 and beyond is to help create healthier lives through the effective prevention and treatment of infectious diseases. 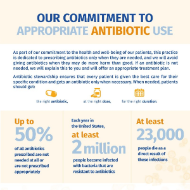 In that spirit, we continue to share messaging that annual influenza (flu) vaccination is the best way to reduce the risk of flu and flu-related complications. 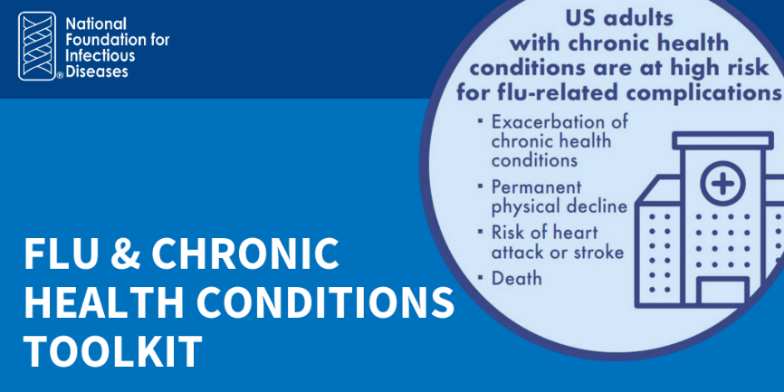 Flu can be deadly for anyone, and individuals living with chronic health conditions—including heart disease, lung disease, and diabetes—are at greater risk, even when their conditions are well-managed. A recent NFID national survey found that most US adults are not aware that those with certain chronic health conditions are at higher risk of flu-related complications, including the fact that for the 15+ million US individuals living with heart disease, the risk of a heart attack increases by up to 10 times within three days of acute flu infection. 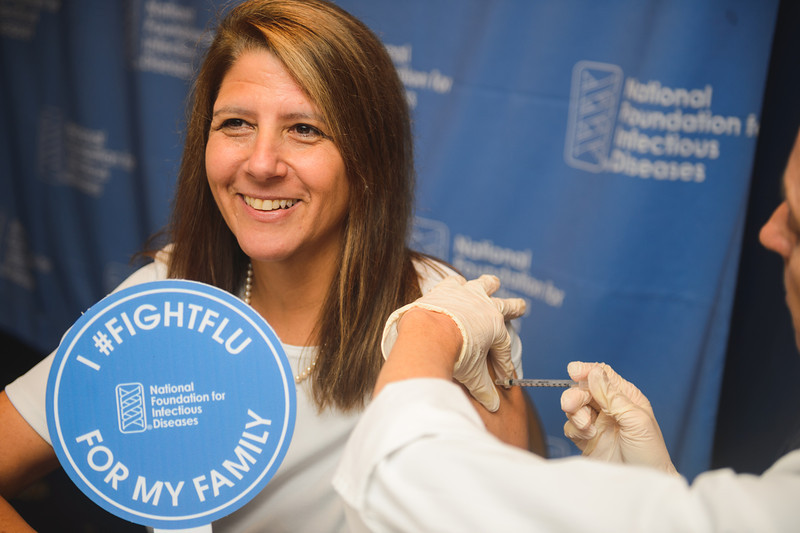 To help reduce those risks, NFID has developed a new online toolkit to increase awareness about the dangers of influenza for adults with certain chronic health conditions and reinforce the importance of annual vaccination. 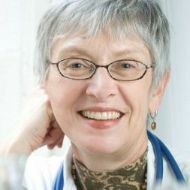 The toolkit includes: A Call to Action supported by nearly 20 national partner organizations, a webinar and journal article (offering continuing education credits for physicians and pharmacists), infographics, sample social media posts, and fact sheets on the dangers of flu for people with diabetes, heart disease, and lung disease. 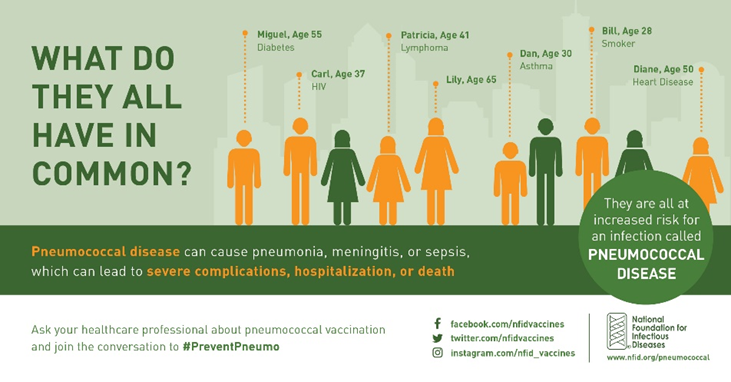 In conjunction with World Pneumonia Day, NFID partnered with social media influencers to share reminders that flu season is also a great time to make sure you are up to date on pneumococcal vaccinations—a message that is particularly relevant for adults age 65 and older as well as those with chronic health conditions. Throughout the fall season, NFID continued to leverage our sponsorship of the 2018 Outland Trophy, awarded annually to the best college football interior lineman, by reminding football fans that getting vaccinated each year is the best line of defense against flu. Working hard to help spread awareness about the importance of flu prevention, the #TravelingFluBug made a special appearance at the EPSN College Football Awards where the 2018 Outland Trophy winner, Quinnen Williams of the University of Alabama, was announced. 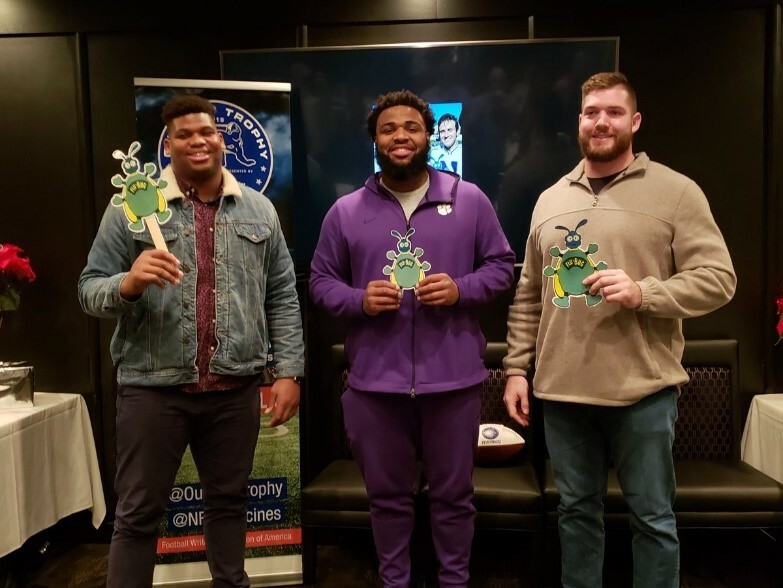 Congratulations to Quinnen (pictured left with other Outland Trophy finalists), who is an avid fan of annual flu vaccination! On behalf of NFID, thank you for your continued support of our efforts to reduce the burden of infectious diseases. I wish you all a happy and healthy holiday season! Join NFID on April 3-5, 2019 in Baltimore, MD for the Annual Conference on Vaccinology Research (ACVR) featuring cutting-edge presentations, continuing education credits, and networking opportunities with vaccinology professionals from around the world. Special Reception Recognizing Women in Vaccinology providing attendees the opportunity to network and engage in conversations about topics impacting the field of vaccinology, while featuring a history of the accomplishments of women in the field. View the detailed program and register online. 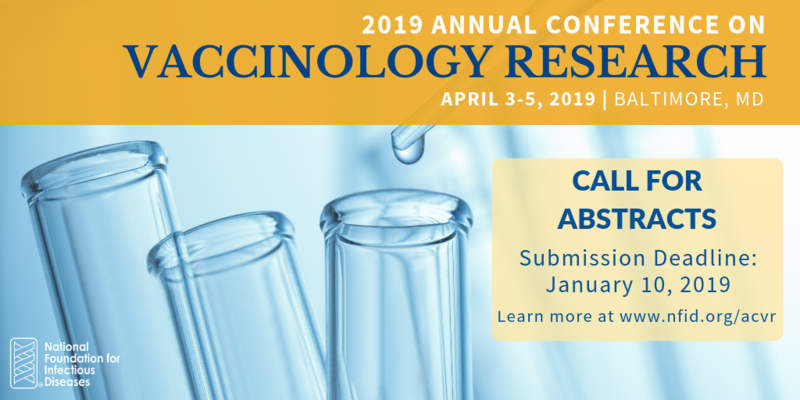 NFID invites abstracts of original work in the field of vaccinology and related research for poster or oral presentation at ACVR. Abstracts are peer-reviewed for quality of research, educational and scientific content, and overall impact. Don't miss this opportunity to present your work to an audience of more than 350 vaccinology experts from around the world. Submission deadline is January 10, 2019 at 11:59 PM. Learn more and submit online. Hepatitis B is a serious liver disease that is easily spread. 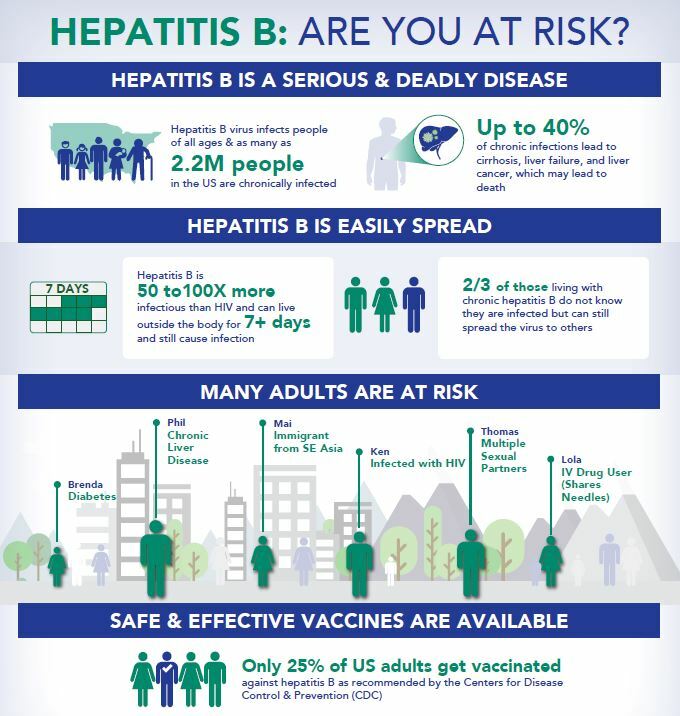 Although there are safe and effective vaccines available in the US to protect against hepatitis B virus (HBV), only about 25 percent of US adults get vaccinated against HBV as recommended. Those who are not vaccinated remain at risk for HBV infection, which can lead to liver cirrhosis, liver cancer, or premature death. This immunization gap is of great concern, particularly as the US is experiencing an increase in new hepatitis B infections due to low adult vaccination rates and increasing rates of injection drug use related to the opioid crisis. While the nation struggles to find answers to address the opioid epidemic, a solution to the gap in HBV prevention is easier—better uptake of hepatitis B vaccines. The goals of the NFID Hepatitis B Awareness Initiative are supported by more than 20 organizations representing hepatitis experts, policy makers, healthcare professionals, and consumer health advocates. NFID launched a new HPV (human papillomavirus) awareness campaign (The Talk) in collaboration with DoSomething.org, a not-for-profit organization for social change with a digital platform reaching more than 6 million adolescents. HPV is the most common sexually transmitted infection. It can be deadly and is the primary cause of cervical cancer as well as other diseases affecting males and females, including cancers of the mouth and throat, as well as genital warts. In the US, there are an estimated 14 million new infections each year, and 79 million individuals, most in their late teens and early 20s, are infected with HPV. Despite recommendations for HPV vaccination starting at age 11 to 12 years, many teens and young adults remain unvaccinated and are at risk for catching and spreading the infection. Through 'The Talk' campaign, NFID and DoSomething.org partnered to make conversations about HPV prevention easier. Read some of the inspirational stories submitted by DoSomething members. 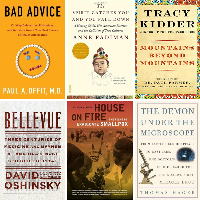 NFID is a proud supporter of the Smithsonian exhibit, Outbreak: Epidemics in a Connected World, that explores pandemics and emerging infectious diseases. The National Museum of Natural History offers a free, do-it-yourself (DIY) version of the exhibit that can be customized for local communities/specific audiences, including multiple languages. For more information, contact NMNH-ExhibitsDIY@si.edu. Every Child By Two (ECBT) has a new name—Vaccinate Your Family (VYF): The Next Generation of Every Child By Two. The new name reflects an expanded mission to protect people of all ages against vaccine-preventable diseases by stressing the importance of timely vaccinations and supporting pro-vaccination policies. For more information, view the redesigned VYF website and blog. 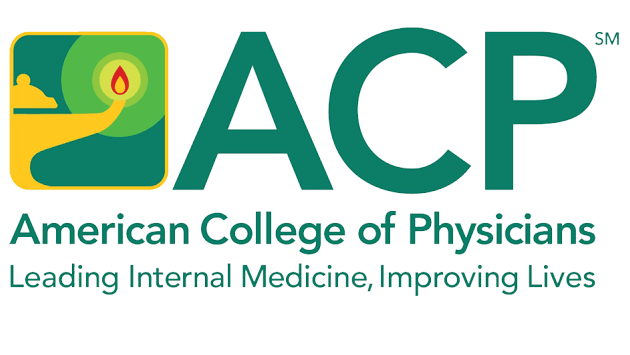 The American College of Physicians (ACP) has developed a new online Adult Immunization Resource Hub as part of the ACP 'I Raise the Rates' initiative to help physicians and their teams assess, understand, and improve adult immunization rates and patient outcomes in their clinical settings. 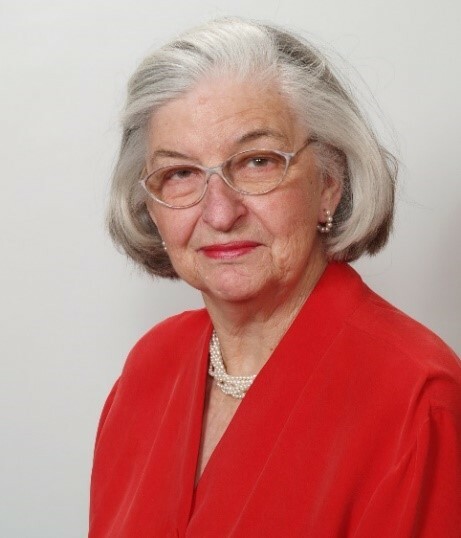 A life-long advocate for children and immunizations, Betty Bumpers passed away on November 23, 2018 at her home in Little Rock, AR. She was 93 years old. In 1974, Bumpers forged a partnership with Rosalynn Carter, when the two were the first ladies of Arkansas and Georgia respectively, to improve immunization services for the children in their home states. During the Carter administration, they worked together in support of immunization programs and were credited with the passage of state laws mandating vaccines for school-entry. In 1991, they founded Every Child By Two, following a devastating measles outbreak that took the lives of many children. NFID joins many others in mourning this tremendous loss. 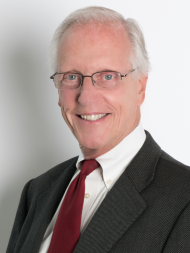 NFID Medical Director William Schaffner, MD, was honored with the 2018 D.A. Henderson Award for Outstanding Contributions to Public Health by the Infectious Diseases Society of America. The award was presented in recognition of Dr. Schaffner’s work to advance the nation’s health through research, teaching, mentorship, and tireless advocacy for science-based immunization policies. In debates fueled by vaccine skepticism, he has earned a national reputation for providing facts and reassurance to both healthcare professionals and the public. Kathryn M. Edwards, MD, was honored by the University of Maryland School of Medicine as the 2018 Frontiers in Vaccinology lecturer. The annual lecture is presented by the university’s Center for Vaccine Development and Global Health. Dr. Edwards chairs the Division of Pediatric Infectious Diseases at Vanderbilt University Medical Center. 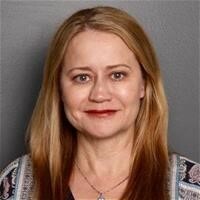 She received NFID Maxwell Finland Award for Scientific Achievement in 2018. 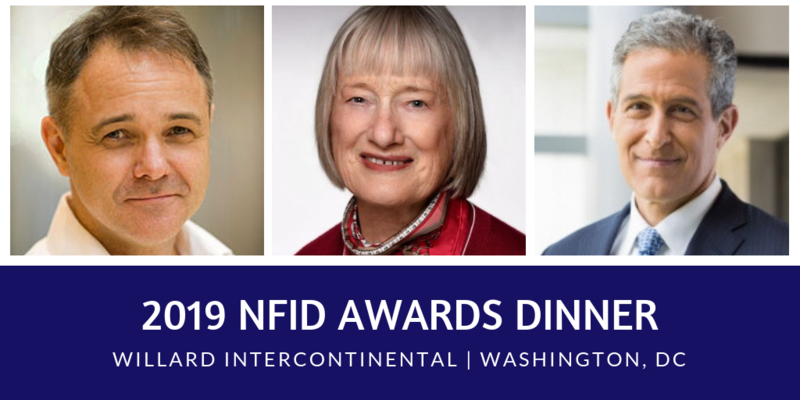 Join NFID on Thursday, May 9, 2019 at the historic Willard InterContinental Hotel in Washington, DC for the 'Oscars of Infectious Diseases,' a festive evening celebrating distinguished leaders and public health heroes. In addition to inspirational presentations, the black-tie event will feature a cocktail reception, dinner, and dessert reception along with a silent auction to support NFID. Additional information is available at www.nfid.org/awards. Online ticket sales will open in January 2019. For the past 45 years, NFID has played an important role in the fight against infectious diseases. During 2018 alone, we educated thousands of healthcare professionals and worked with partners to extend our reach to teens and young adults, older adults, as well as other audiences. But there is more work to do. You can help us continue our impactful work by making an online donation. Together, we can make a difference! Copyright © 2018 NFID, All rights reserved.